Kemi is a town and municipality of Finland. Ask Inspirock to suggest an itinerary and make planning a trip to Kemi fast, fun, and easy. Austin, USA to Kemi is an approximately 23-hour flight. Traveling from Austin to Kemi, you'll lose 8 hours due to the time zone difference. Traveling from Austin in March, things will get colder in Kemi: highs are around 32°F and lows about 16°F. Finish your sightseeing early on the 11th (Mon) so you can drive to Akaslompolo. On the 12th (Tue), ski along the peaceful trails at Torassieppi Reindeer Farm & Cottages and then head outdoors with Scandinavian Adventures. Get ready for a full day of sightseeing on the next day: stop by Akaslompolo Sportshop, then steep yourself in history at Keimioniemi Fishing Cabins, then explore the activities along Pakasaivo, and finally don't miss a visit to Snow Village. For more things to do, photos, and more tourist information, go to the Akaslompolo online trip builder . You can drive from Kemi to Akaslompolo in 3.5 hours. Alternatively, you can take a bus; or take a train. March in Akaslompolo sees daily highs of 31°F and lows of 16°F at night. Wrap up your sightseeing on the 13th (Wed) to allow time to drive to Levi. Kick off your visit on the 14th (Thu): relax in the rural setting at Ounaskievari Reindeer Farm, experience rural life at Santa"s Cottage & Pet Farm, then surround yourself with nature on a nature and wildlife tour, and finally make a trip to Giewont Husky Adventures. On the 15th (Fri), you'll have a packed day of sightseeing: make a trip to LUVATTUMAA - Levi Ice Gallery, then take in the dramatic natural features at Keimiotunturi Fell, and then see the interesting displays at The Sarestoniemi Museum. To see more things to do, where to stay, other places to visit, and tourist information, use the Levi online trip itinerary planner . Traveling by car from Akaslompolo to Levi takes 1.5 hours. Alternatively, you can take a bus. 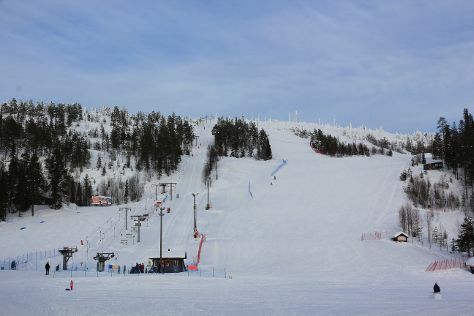 In March, daily temperatures in Levi can reach 31°F, while at night they dip to 16°F. Wrap up your sightseeing on the 15th (Fri) early enough to travel to Saariselka. Visiting Reindeer Farm Petri Mattus and Tuula's Reindeer will get you outdoors. Explore hidden gems such as Lemmenjoki National Park and Saint Tryphon Pechenga Orthodox Church. Get out of town with these interesting Saariselka side-trips: Inari (Pielpajarvi Wilderness Church & Inari Reindeerfarm). For more things to do, reviews, where to stay, and tourist information, go to the Saariselka trip itinerary app . Do a combination of bus and flight from Levi to Saariselka in 3 hours. Alternatively, you can drive; or take a bus. March in Saariselka sees daily highs of 29°F and lows of 13°F at night. Cap off your sightseeing on the 18th (Mon) early enough to go by car to Luosto. Kick off your visit on the 19th (Tue): hit the slopes at Pyhatunturi and then see exotic creatures in open habitats at a safari tour. To see traveler tips, more things to do, maps, and tourist information, go to the Luosto day trip planner. You can drive from Saariselka to Luosto in 2.5 hours. Alternatively, you can take a bus. In March, plan for daily highs up to 30°F, and evening lows to 11°F. Wrap up your sightseeing on the 19th (Tue) to allow time to travel to Salla. Salla is a municipality of Finland, located in Lapland. Kick off your visit on the 20th (Wed): tour the pleasant surroundings at Salla Ski Resort, then learn about all things military at Salla Museum of War & Reconstruction, and then contemplate the long history of Paikanselan Taistelualue. For maps, other places to visit, reviews, and tourist information, read our Salla route website . Traveling by car from Luosto to Salla takes 2 hours. In March, daytime highs in Salla are 29°F, while nighttime lows are 12°F. Finish your sightseeing early on the 20th (Wed) so you can travel back home.